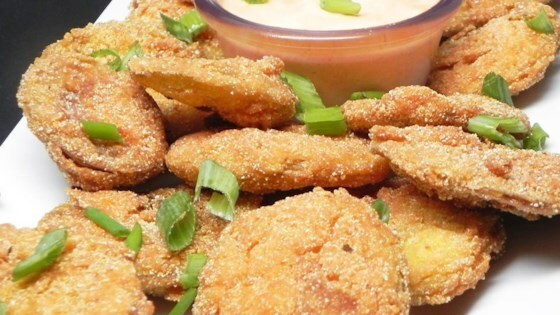 "Simple recipe for fried green tomatoes, perfect for appetizers or a unique fried green tomato B.L.T.!" Beat eggs and water in a shallow bowl. Place flour and cornmeal in 2 separate shallow bowls. Season cornmeal with salt and pepper. This Carolina Girl LOVED it! Add a dash of salt as soon as they come out of the pan! My mom and grandmother used to make these.They were very good.I made them for my husband who had never tried them.He thought they were different but very good. Easy, tangy, and tasty. Make sure you slice your tomatoes thin, so they cook through and through. I would make these again. Such an easy recipe. My fried green tomatoes turned out delicious! This is a very good recipe. I added a little cayenne pepper to the flower to spice it up a bit. The batter sticks to the tomato slices well. I saved this to use again. Thanks! !